What Should the Wolves Want in a Jimmy Butler Trade? Jimmy Butler reportedly told the Timberwolves he preferred to get traded to the Heat. But what should Minnesota and Tom Thibodeau seek from the Heat in return? The Open Floor podcast discusses. 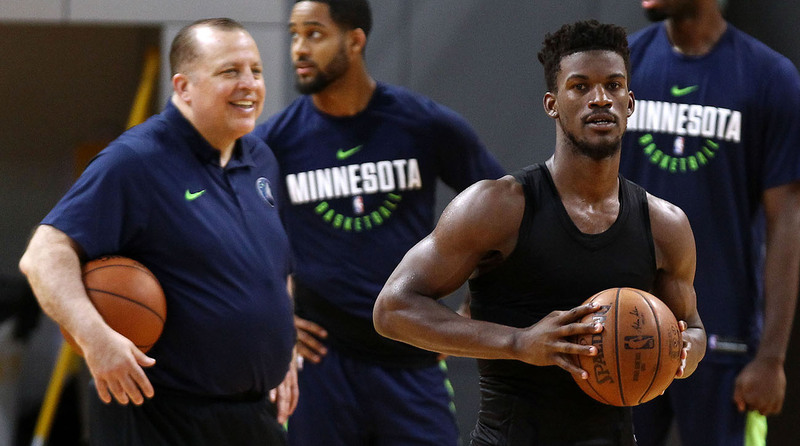 Not much has happened since the news broke that All-Star Jimmy Butler was seeking a way out of Minnesota. There have been several reports and rumors of teams interested, with the Heat, Rockets, Clippers, Nets, and Knicks among them. There was also a hilarious report about the Wolves asking for the 76ers’ Ben Simmons in a trade. With NBA preseason starting and the regular season on the horizon, the Timberwolves might want to get a deal done sooner rather than later. Andrew Sharp: How are you feeling about the Wolves right now? This is why you don’t do this backed into a corner in September, because all of these teams understand how precarious your position is. I think we should look at these rosters, though: Miami’s roster, the Clippers’ roster, Knicks, Nets and whoever else you think would maybe get in this trade scenario. What are the pieces? If you are Thibodeau—and we talked about this a little bit last week but we really didn’t dive in—but what are the pieces that will be like, ‘Okay, that is enough for me to get it done?’ Obviously, Thibodeau has to lower his expectations—that will naturally come because they won’t be able to get a great piece. But what’s the best type of piece that you think he could get in a Jimmy Butler trade right now? Sharp: If I am Thibs, I am looking for a wing, because who knows what Thibs is usually thinking. He has built that team. There are three point guards in Derrick Rose, Tyus Jones and Jeff Teague. There are several big men and they are really going to be light on the wings beyond Wiggins once they lose Jimmy Butler. Gollliver: Slow down. I don’t know if we can give him credit for building this team. [Laughs]. He kind of threw it together. He builds in the same way that I cook. He’s just throwing ingredients. I make peanut butter tacos; his roster is the peanut butter tacos of rosters. Sharp: Maybe mismanaged is the better verb to use in what Thibs has done out there. The Woj tweets were hilarious. He wants quality vets, future assets, cap relief, and it’s like, 'Okay, good luck with that.' But the Thibs situation is interesting because teams sense that there is blood in the water with him, and I think the situation is getting exaggerated by real Jimmy Butler suitors to try to drive down the price here and Thibs is a really easy target right now. I don’t blame him for waiting. Golliver: They have to resolve this. Let’s say he is still the coach unless he is trying to get himself fired. If he’s still the coach, they need something back for Jimmy immediately. They can’t go into the season with Jimmy held out. Look at their lineup, it’s an absolute mess if they don’t have any parts coming back to fill that hole. They need something there and that’s why I think people are sort of like waiting for him to finally admit that he is bluffing or waiting for ownership to get really desperate. To answer the question that I asked earlier though, if they can get Josh Richardson from Miami as the centerpiece guy coming back, shouldn’t that get this deal done? If I am Miami, I am kind of saying, ‘Oh, you can choose from Justise Winslow, you can choose from James Johnson’. You kind of float these other players out there. Like ultimately if push comes to shove and they are saying, ‘Okay, we will give you Josh Richardson’, shouldn’t that be enough for Minnesota to say we are not going to do better? They seal this as a young Jimmy Butler coming back with some real upside and a great contract. I think that’s where this whole thing should be headed but I don’t know if we will get there, though. Sharp: Yeah, I don’t love Josh Richardson as much as other people do and as much as Heat fans have the last few years. I think there are shades of Jimmy Butler like how Jaylen Brown is not going to magically turn into Kawhi Leonard over the next few years. I think the curve for Jimmy was linear because no one could have anticipated how good he was going to become. I think it’s more likely that Josh Richardson is going to be a fourth or fifth starter, and even that is a huge win at this point in the process. I completely agree, if you can get Josh Richardson from Miami that is going to get the deal done. I bet that has not been offered to Thibs at this point, and that’s part of the holdup and it’s currently a staring contest.